To reach mobile customers efficiently, Webjet wanted to promote its new app to a larger audience without juggling multiple Google Ads campaigns. 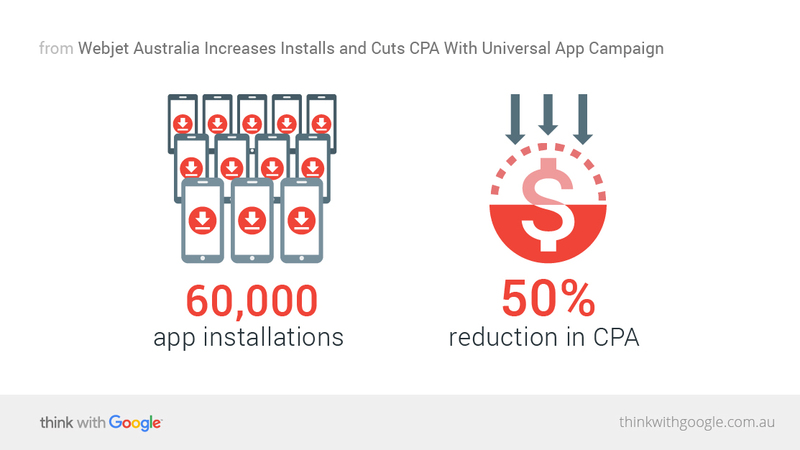 Running a Universal App Campaign allowed the company to streamline its efforts and helped drive 60,000 new installs while cutting CPA by 50%. As a leading online travel agency in Australia and New Zealand, Webjet's goal is to be there for travellers as they plan every detail of their next excursion. And a strong mobile presence is essential for the business to be right at people's fingertips in all their I-want-to-plan-a-trip micro-moments. In the past, promoting an app across the entire Google network required Webjet to actively maintain and manage a large number of individual ad campaigns for Search and the Google Display Network (GDN). Webjet set up a UAC to combine its efforts into a single campaign in a few simple steps. "Universal App Campaigns allowed us to generate immediate app installs at a competitive CPA." Google Ads pulls images, videos, and description text from the Webjet app's Google Play store listing to generate install ads unique to each platform. After Webjet set a daily ad budget and target CPA, the UAC promoted the app across the entire Google network. Over time, Webjet's best-performing ads were rotated in and displayed more often. Google Ads also determined the optimal ad placement to drive clicks on each platform based on related keywords or app categories for ads on Search and Google Play store, relevant content on YouTube, and other relevant apps or mobile sites on GDN. Webjet's Universal App Campaign helped drive 60,000 new app installations while reducing its CPA by 50%. The company also saw a noteworthy increase in engagement from users who clicked through to the app from UAC ads compared to clicks and conversions from other sources: Google Ads users spent 39% more time in app, and their conversion rate was 22% higher. "Universal App Campaigns allowed us to generate immediate app installs at a competitive CPA," concluded Morris Bryant, partner at Sparro.